Sometimes there comes a show that’s just plain mystery because very little of it that survives. What the show was like, who worked on it, where it came from. Today, I’m going to write about one such show. So comes Robotan. Daiko Advertising saw how successful Tokyo Movie’s Q-Taro the Ghost was on television, gaining 40% share in ratings, so they decided to produce their own show in an effort to gain some quick cash in ad revenues. They hired Kenji Morita (born 1939), a cartoonist with several titles already out (most notably Marude Dameo), to create a similar cartoon and also do a comic version to be published simultaneously with the show. 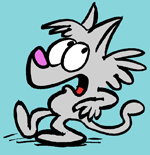 The comic ultimately ran in Shonen Gaho. 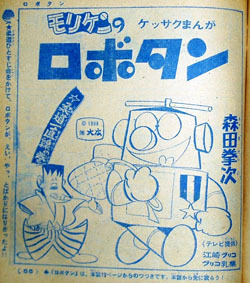 Similar to Q-Taro, Robotan also centered on the “wacky friend moves in with a boy and his family” premise that became a trend in Japan on-and-off throughout the 1960s to the present. 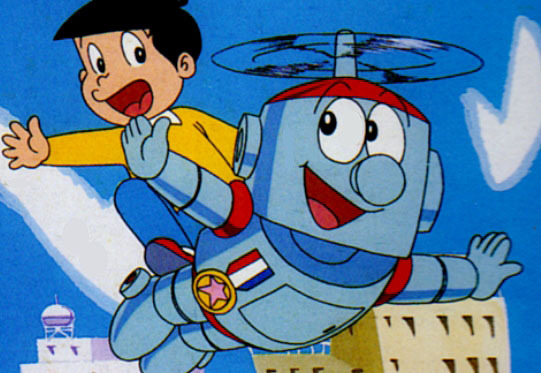 Robotan is a robot with a propeller on his head that befriended a boy named Kan-chan. Their rival was Bocchi, a little boy genius (he’s always seen sucking on a pacifier) bent on getting Robotan. The robot’s favorite food is bananas and is always seen eating them in huge bulks. Like “Q-Taro”, the show was a gag-comedy with each half-hour split into two segments. More and more gag-anime would follow. Being a major ad agency in Tokyo, Daiko had no problem finding a sponsor. In this case, it was Glico, a candy company that already sponsored Tetsujin 28-go (aka Gigantor). The timing couldn’t be perfect, as Gigantor had just finished its 97-episode run in mid-1966. Daiko farmed out animation to several studios, all located in Osaka, an unusual move as most animation production was occurring in Tokyo at the time. Studios involved are Puppe Production, A Production, Sun Production, and Nakamura Production. 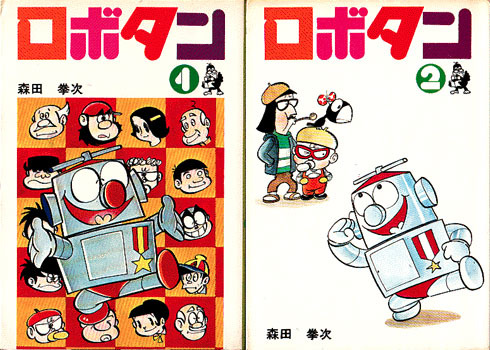 Puppe Production was founded in 1963 by Renzo Kinoshita (1936-1997), who worked on several TV shows (including Robotan) before devoting his time to independent shorts such as Pikadon (1978). Nakamura Production was run by Yasuo Nakamura, having come from Osaka Telefilm Center, doing cartoon designs for commercials. The A Production that worked on this show (established to handle workload on “Robotan”) is not related to the A Production that later became Shin’Ei Doga, which was based in Tokyo. Sun Production was yet another studio that was producing commercials. All stories were handled at Daiko, which would then be sent to the four studios, taking turns producing episodes. The films would then be sent to Daiko for editing and dubbing work. Robotan, remarkably, managed to outlive the first Q-Taro anime. It aired on Fuji Television from October 4, 1966 to September 27, 1968 for 104 episodes (“Q-Taro” ended in 1967 and had 96 episodes). Even with that many episodes, however, it’s not sure known exactly what survives of it. In 2010, two 35mm black and white picture negatives (no soundtrack) for the anime showed up on Yahoo Japan’s auction service. Apparently Daiko threw the films out years ago, with various items going to different people here and there in the process. The negatives sold relatively cheap, under $100. Here’s hoping that whoever bought them are taking good care of them. This whole thing smells very familiar. 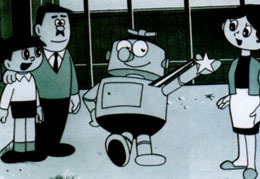 In 1985, there was an American character, Robotman, who was also pint-sized and propellor-topped, and who moved in with a normal suburban family. A TV special was made, toys were produced, and a newspaper comic strip commissioned – a lot of bucks were spent, but in the end it flopped and the project abandoned. But the comic strip lived on – its creator, Jim Meddick, was given a free hand to do what he liked, and he quickly dropped all the goopy hugs and rainbows stuff and fashioned a more satirical model Robotman, one who looked more like a squat middle-age man than a humanoid alien. By the early aughts the lead character was retired, I’m guessing partly because there’s no percentage in working on a project you don’t own, and anyway he was basically just a straight-man to a hipster-doofus named Monty. The Monty strip split off and continues today. They both fall under the same lines of corporate/committee-originated concepts with the intent on exposure through all forms of merchandising and media. This became more apparent in the 1980’s when American Greetings started tinkering with such home-grown IP’s like Strawberry Shortcake and Care Bears. Japan was no different in that respect given how often the successful shows were often the result of synergy and cross-marketable appeal, of course they had several decades of experience in that by the time the American companies catch up in the 80’s. Reminded myself of one such project that was put together by Sega and Tatsunoko some may remember called “Zillion”. It was developed as both an animated series and several video games for Sega’s 8-bit console. Those games tend to be really the only exposure anyone outside Japan had seen of it. Years later the anime series was picked up by Carl Macek’s Streamine Pictures though only five episodes were ever released in English-dubbed form including a follow-up OVA called “Burning Night”. I have one off-topic question for you: Have you seen this movie yet? Yet another cute series we missed out on. The 86′ version has been aired outside of Japan though judging by what’s been uploaded to YouTube. Looks like it’s still available too if anyone cares to license said program! Of course, this classic of TMS is great. On Dailymotion.com appears the original TMS opening.